These lines from The Ballad of Reading Gaol are etched into Oscar Wilde’s tomb at Père Lachaise Cemetery in Paris. The inscription is found on the back of the tomb, behind the giant sphinx that lies on the front. Wilde’s mourners were outcast men. People continue to mourn for him. Alien tears continue to fall for him. A mix of personal mourning and collective ritual takes place at Père Lachaise Cemetery. This is especially the case at Wilde’s tomb where personal notes are on display for others to read and where ritual has become part of the tomb itself. Among the tokens left when I visited were a ‘Born to be Wilde’ magnet, a tube of lipstick, artwork of the tomb, flowers, and a bottle of absinthe. Wilde’s tomb is more than a site of memory. It is also a site of controversy. I think Wilde would like the controversy. It means, afterall, that people are still talking about him. People – visitors, pilgrims, mourners – have been visiting Wilde’s tomb for decades. In that time a collective and controversial ritual has developed. People leave lipstick kisses for Wilde. Others have left notes, written in lipstick, on the tomb itself. It has been cleaned and cleared, and finally closed off. It’s not clear when, or why, this ritual started, but it’s become a way of people leaving their individual mark, while at the same time taking part in a collective act. There are three different signs asking visitors to respect the tomb. One can be seen in the above image. It asks the mourners to respect the memorial of Oscar Wilde and explains that it was restored in 1992. Two more signs (or warnings) have been placed there since a glass partition was placed around the tomb in 2011. There were also names, dates and lipstick kisses. There were also a few indecipherable lines, because lipstick is hardly the easiest writing tool. 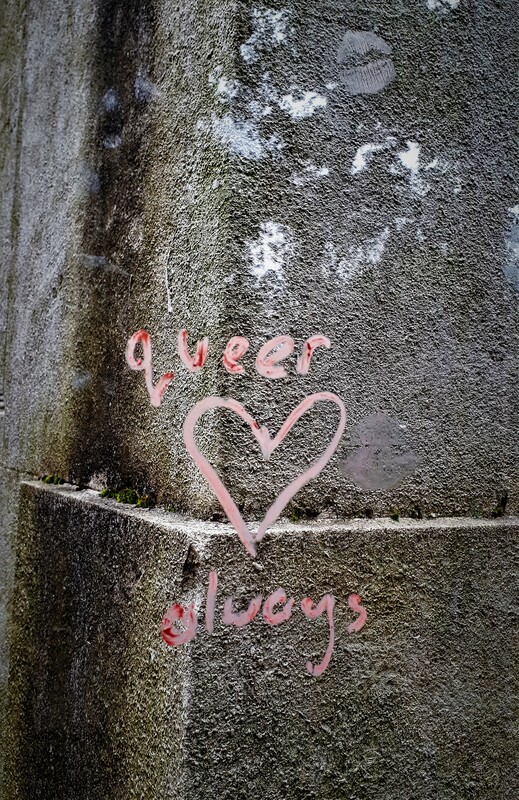 The different themes of messages – adoration, thanks, quotations of Oscar’s own words and queer solidarity – are mixed with different shades of lipstick. People come to visit Oscar’s tomb for different reasons, and with different emotions. And yet, people from all over the world have mourned together in this collective, queer, lipstick-based ritual. This ritual opens up lots of questions about commemoration and the physical state of memorials. What is ‘acceptable’ behaviour from visitors? What is vandalism? Is all art useless? How important a part of the site are the rituals people create? One critic of the glass partition argued that ‘a drooled and kissed over tomb is as much history as the man who’s resting there.’ The rituals certainly tell us a great deal about Wilde and his admirers today. Now lets return to The Ballad of Reading Gaol. ‘The coward does it with a kiss’. Wilde wrote this in reference to how each man kills the thing he loves. Now his outcast mourners bring their alien tears, and mourn for him. They commemorate him for different reasons. The mourner does it with a kiss. Wilde is far from the only person to be commemorated with mementoes and notes. Many are covered with flowers or ribbons. Chopin’s gravestone is covered in notes and Polish flags. Cinema ticket stubs laid on the tomb of Georges Méliès mark his role as a film maker. The gravestone of Jim Morrison (The Doors) is covered in photographs and flowers. Like Wilde’s, his tomb (and others surrounding it) has been cordoned off to stop visitors marking (or vandalising) it. Also like Wilde’s tomb, Morrison’s mourners have created their own form of group ritual. It’s even more unusual than the lipstick kisses. Chewed pieces of chewing gum are stuck to the tree nearest his grave. You can smell mint in the air. Perhaps that’s the best way to explain the rituals at Père Lachaise and other cemeteries. People are strange. They bring their alien tears, they visit their outcast idols, they find ways to connect to others. They always mourn. HI Claire! Is there any way I can contact you by email about speaking at an upcoming conference at UCL? I have had a quick search online but can’t seem to find it anywhere…many thanks!